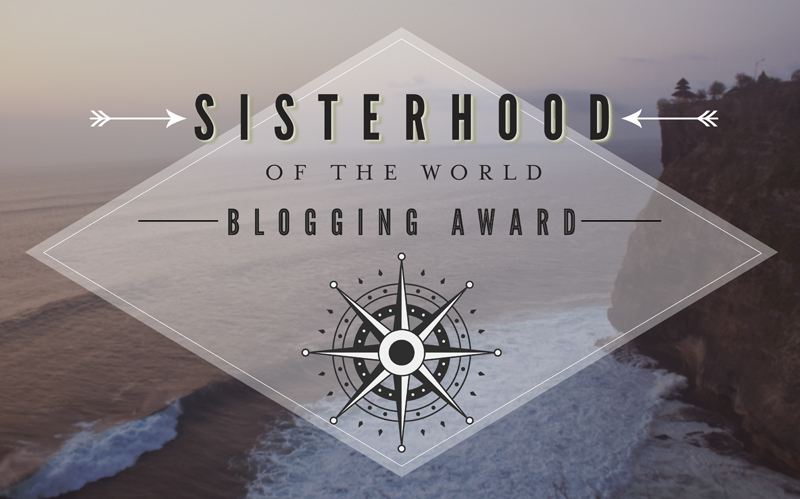 I was nominated by Amanda of Burger Abroad to take part in the SOTW Blogging Award, a peer-nominated travel blogging award given to women, by women! Once you get nominated, thank the giver, answer the questions (or in my case: pick and choose from others’ / make your own – sorry, I can’t follow rules apparently! ), then award other awesome sisters! Read on for a story about a dead monk, noodle soup and Costa Rica destinations. 2. What do you love most about travel blogging? 3. 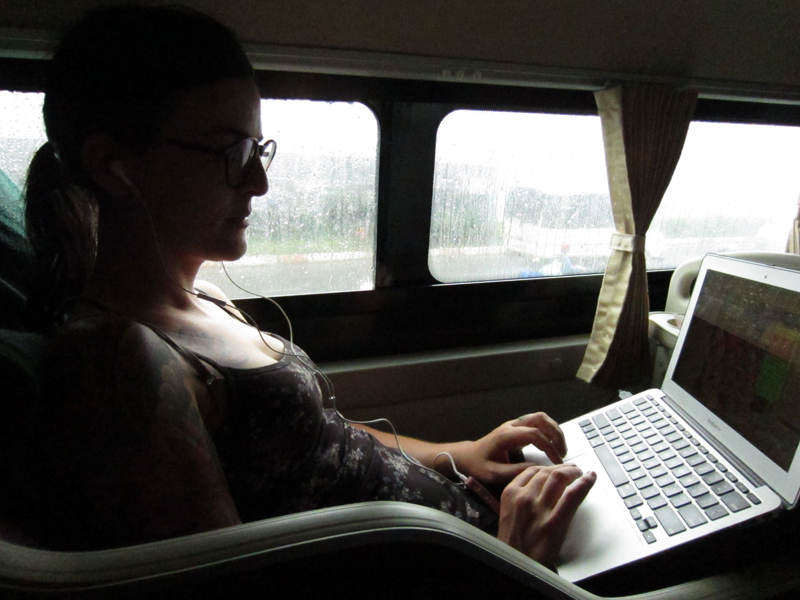 What drawbacks are there to travel blogging that many people don’t realize? 4. What was the most beautiful sight you have visited during your travel? 5. What about the weirdest sight? 10. What destinations are at the top of your bucket list? 7. What was your best meal during your travels? 8. What is the best local drink you have ever had and where? 9. What was the worst ‘travel scam’ or situation while travelling that you have experienced? I started blogging in 2007 when I was in photography school. I’m a little embarrassed to share this, but here’s the link to my old blog! Mostly Amélie was born in 2010, and had different names throughout the years. Back then, it was about everything and anything and had no specific focus. I’ve since made most of the posts private because they were really awful! The blog truly found its voice in the course of the last year and a half when I became a full time traveler. Connecting with other bloggers! I feel like I have made such good friends this past year and a half and it’s a great support system to be able to share our experiences with one another. Obviously, being location independent is also great. I don’t think I will be able to revert back to being an employee in a large company. The cubicle life is dead to me, and hopefully forever. It is so much work. In the beginning, for absolutely no money. While other people at your guesthouse are out having fun in the sun, you stay sat at your computer and you work, and you work, and you work. Often, you want to give up, but then you think, “if I give up now, I’ll never make it”. And if you do make it, you make very little money to begin with. You revert back to living on a budget like when you were in college to be able to travel. It is not a glamorous lifestyle, but it’s one that fulfills me and makes me happy and it’s allowed me to have a much greater relationship with money. It takes me very little to be happy! 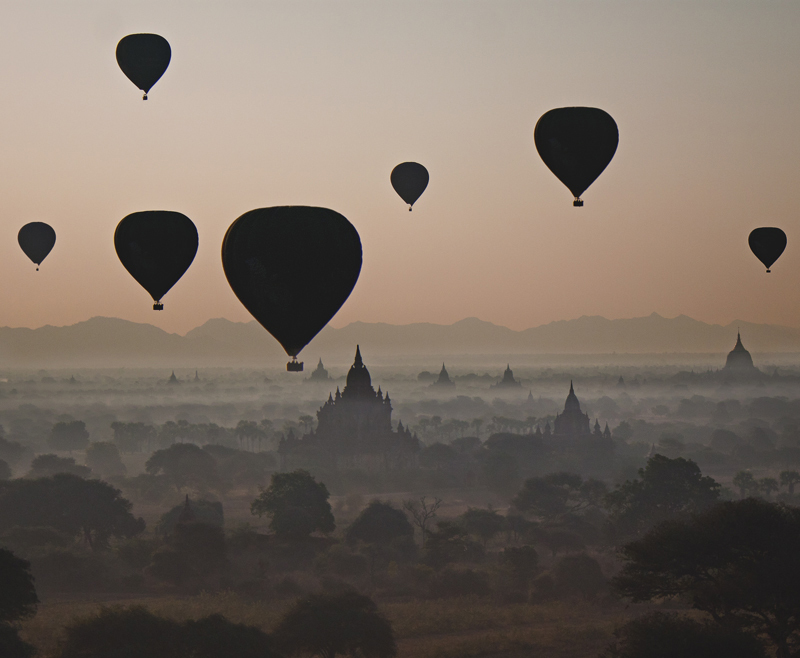 Possibly the sunrise over the temples of Bagan in Myanmar. I’m generally not an emo person, but this place was so magical that I started bawling my eyes out for some weird reason. Haha! Bagan, Myanmar, a truly magical place! 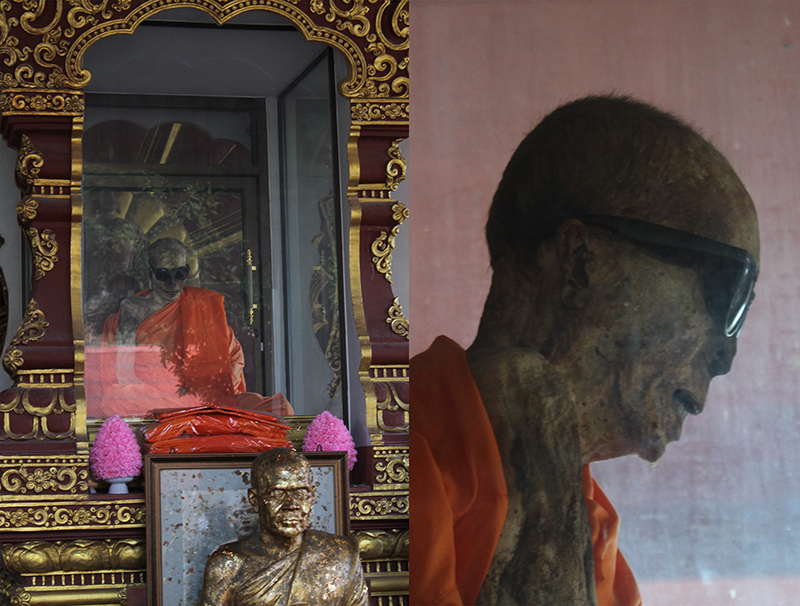 Visiting the mummified monk at Wat Khunaram in Koh Samui, Thailand. I just, I… Yeah. Scandinavia, Iceland, Japan, Iran, Istanbul, Berlin, Costa Rica. There were so many! I hate to be cliché, but I just love a good noodle soup and there have been great vegan versions of traditional dishes everywhere I’ve been in Asia. Most notably, I would say the laksa at Luk Yea Yan in Georgetown, Malaysia and the khao soi at Kaow Soi Noodle in Ao Nang, Thailand. There’s nothing like a big bowl of spicy, coconutty, creamy noodley goodness, is there? I think drinking extremely sweet and strong Vietnamese coffee on a miniature stool in the middle on utterly mad Saigon would be pretty close to the top of the list. 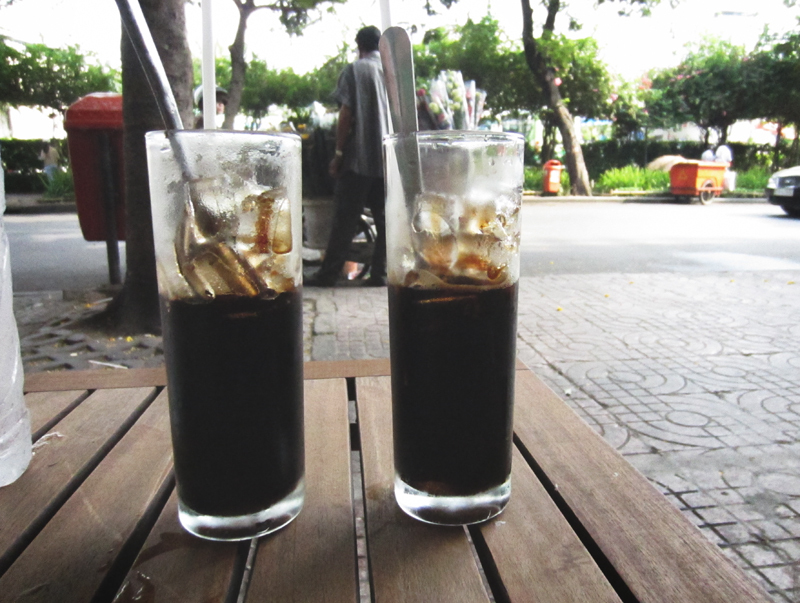 I’ve since learned that Vietnamese coffee is not always vegan! And I’m not talking about weasel coffee here: apparently the beans are sometimes roasted with butter and fish sauce to give them a specific aroma. That’s your Buzz Killington award for today. I’ve been lucky enough to not really endure any serious scam while in South East Asia. Once, in Vietnam, I booked a bus ticket through my hotel and they generously offered me a ride to the bus station on a scooter. Except, they clearly didn’t take me to the bus station, but rather at a random ticket office where I was squeezed into the back of a Ford Explorer with my knees to my chins and 7 others (for a total of 9). I just assumed that it was my pick up to the actual bus station. I mean, if a guy is just selling seats in the back of an SUV, why is he bothering to write tickets, right? RIGHT?! The Explorer *was* the bus. As this slowly dawned on me, I did what I haven’t done since I was 16 years old: I had a full fledge panic attack. I tried to ask the other people through my melt­down where the big bus was, but got blank “why is the white woman crying” stares for a reply. I managed to have them let me out by the curb after a while and, by some miracle, got picked up by a real bus (where everyone was being sick in a plastic bag) shortly thereafter. I’ll be cycling between Penang in Malaysia and Bangkok next month with a stopover in Koh Phangan to do a Vipassana meditation retreat, but shhhhh, it’s a secret! I’m attending TBEX Asia in October in Bangkok and I am thinking about going to Europe afterwards. I know! Leaving Asia! Madness. Those are only some loose plans though; I’m just going with the flow right now. I am nominating Jade of We Travel And Blog, Franca of Angloitalian Follow Us and Diana of North to South. 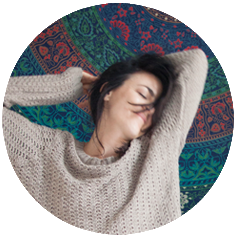 This entry was posted in Travel on July 16, 2015 by Amélie.